Sister has to decide between soccer and the spelling bee! Sister bear is excited to be in the spelling bee, but perhaps Papa is actually living vicariously through her accomplishments, putting a bit too much pressure on her to move on to the next level of the competition. Realizing his mistake, Papa takes the pressure off at the end of the story, accepting that sister-bear may have other things she'd rather do than be her Papa's spelling bee star. Providing a teachable moment for both kids and their parents, this is a great title for learning about our own limitations. It also could be used to spark great conversations with kids about when it is good to be 'pushed' to accomplish things and when this pressure is 'too much' from adults. Like the other digital Berenstain Bears books from Oceanhouse Media, this title is interactive in a way that enhances early reading skills. Most images (of the bears, the spelling words, items in the school, etc. ), will name themselves aloud while the word briefly appears over the illustration. For example, touch Sister Bear and "Sister Bear" appears and is spoken aloud by the narrator. For young readers and pre-readers, the text also highlights as the word is spoken. The Berenstain Bears books have been favorites of more than one generation of parents and children. Now, thanks to Oceanhouse Media, they have a new life in digital. But even in this modern medium, the messages themselves are timeless. This one is particularly relevant to modern kids, who are often over scheduled and feel pressure to achieve in a lot of different areas. 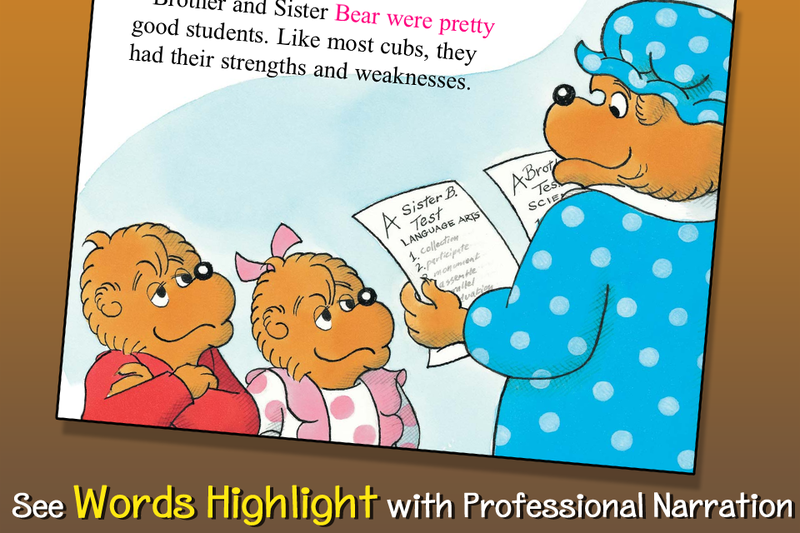 Sister bear is a really good speller, and when the spelling bee contest arrives at their elementary school she is expected to win in her class. This year, she will also get to go to the school spelling bee AND if she wins that, there are national contests she can be entered into. But Sister is also concerned about her soccer team. She may have to miss the 'big game' if she is chosen for the spelling bee competition. How can she decide which event is most important? Her teacher says, "There will be a lot more soccer practices, but there's just one school spelling bee." As the whole bear family gets excited, sister bear is still unsure if it's okay to let her team down by missing practice. Her parents even argue about putting 'too much pressure' on her for the spelling bee. But Papa is very proud of his daughter and wants her to compete. This means sister bear has to practice spelling words rather than go play with her friends, something difficult for her to understand. When the big spelling bee contest arrives, the whole bear family is watching and eagerly waiting for sister-bear's performance. Soon she is the last 'cub standing' in the contest, trying to spell "vicarious". When sister-bear spells it correctly, she is now ready to go to the "All-Schools Spelling Bee in Big Bear City!" After the spelling bee, sister bear tells Papa, "I don't know how to say this, and I don't want to disappoint you, but I don't want to go to the All Schools Spelling Bee in Big Bear City. I just want to go to school, play soccer, and do things with my friends." Papa bear isn't disappointed and sends sister bear and her brother off to play ... maybe not continuing on to the next stage of the spelling bee at all. From Amazon.com, About the Author: Stan and Jan Berenstain were already successful cartoonists for magazines and adult humor books when they began writing children's books. The first story starring the bear family, The Big Honey Hunt, appeared in 1962. Since then, more than 250 Berenstain Bears books have been published, and more than 260 million copies have been sold. What began as an idea sparked by their young sons' interest in children's books has become over the years arguably the best-selling children's book series ever. Since their inception, the Berenstain Bears stories have expanded to include picture books, beginning readers, and chapter books—even a hit TV show on PBS. Writing and illustrating the books has become a Berenstain family affair. Mike joined with his parents as a creative team in the late 1980s. The Bear family has expanded over the years as well. Sister Bear arrived in 1974, and baby Honey joined the family in 2000. Since Stan's death at age eighty-two in 2005, Jan and Mike have continued to write and illustrate wonderful new adventures for Mama, Papa, Brother, Sister, and Honey Bear. They live in Bucks County, Pennsylvania, which looks a lot like Bear Country.